Even those who love mostly soft and neutral decorating, sometimes crave a bit of contrast or a splash of color. Especially this time of year. You can add a touch of elegance to your Halloween decor by simply playing with the time tested combination of black and white. Add some warm tones of gold and the sparkle of silver and you have a more grown up version of Halloween decorating.. 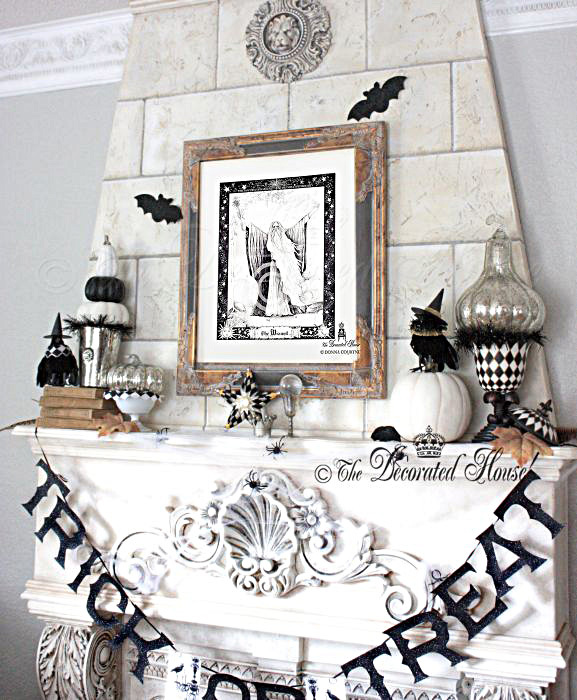 The mantel this year is dressed in black and white again. Whatever your own favorite colors, you can certainly decorate even for Fall and Halloween with the the colors you love. Even if that happens to be without the strong orange or red of the season. You might enjoy the stunning display of the turning of the leaves outside but still like a more neutral look inside. Give it some contrast like black and white, or keep it monochromatic. It can still be very festive and fun! I'm fortunate to have a few pretty black and white artworks to display this time of year. On the mantel this time is a print of my own art, The Wizard. It was done many years ago, and although I consider it to be simply fantasy art, it makes a great addition for Halloween when everyone thinks of magic. The MacKenzie-Childs star ornament is nice for Halloween, even though I usually bring it out for Christmas and New Year's decorating. It adds another element of black and white and silver, and repeats the the harlequin design as well. 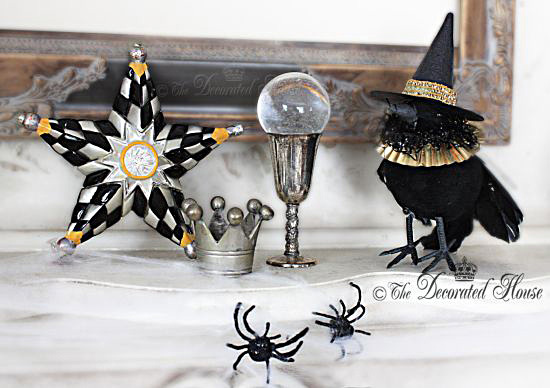 The crows are merry and in a party mood with little witchy hats and decorative collars. This one is sitting on top of a faux (foam) pumpkin painted with Annie Sloan chalk paint. 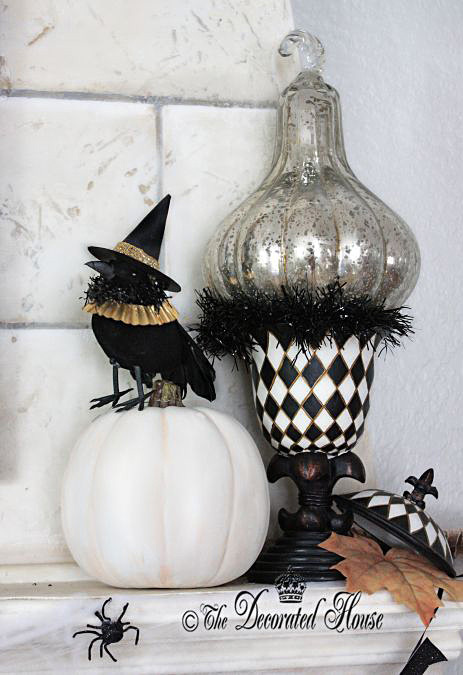 The mercury glass pumpkin and gourd sparkle and reflect light, with one perched atop a cute harlequin patterned urn. A few spiders complete the whimsical feeling. They are only invited inside this time of year, and only if they aren't real! Elegance and whimsical decor at its finest, dear friend!!! Your mantle is looking spectacular!!! I hope you have a wonderful week ahead. Thanks for coming by. It's so nice to meet you. 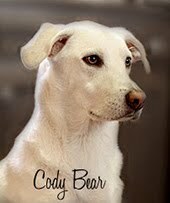 Cindy and I are both dog lovers who decorate! 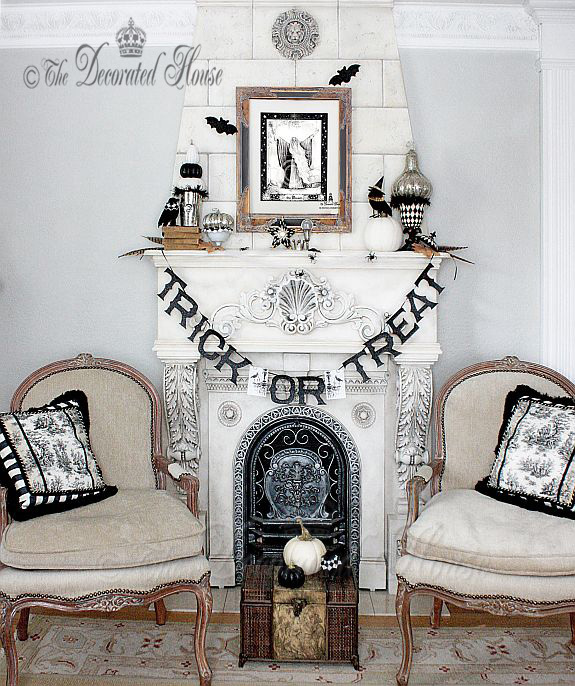 :) The black and white does help get you in the mood to decorate for Halloween doesn't it? Easier for me than too much orange, as I see you understand! Love, Love, Love this color combo!!! Very classy.